With a snowy December, so drifted the last opportunity for PCEI to complete habitat restoration activities for 1999. Troy High School students cheerfully plowed through winter weather to complete a stream bank stabilization project using bioengineering techniques along a 50′ segment of West Fork of Little Bear Creek located within a city of Troy park. PCEI education staff used this restoration project as a hands-on educational opportunity to explore the link between water quality and habitat. The City of Troy, Palouse-Clearwater Environmental Institute (PCEI) staff, and twenty-eight high school students from Troy High School completed the first phase of a streambank stabilization project along an eroding section of the West Fork of Little Bear Creek. On Monday, December 6,1999, the students, their science teacher, Cheryl Campbell, and their assistant teacher braved cold temperatures and steady snowfall to create terraces along the streambank that the City of Troy had reshaped using heavy equipment. Ten class members from Troy High School returned on Thursday, December 9, to complete the stabilization activities. These energetic students shaped terraces along the lower levels of the streambank to provide resting platforms, or shelves, for the placement of coir logs (coconut fiber-filled logs sold under the name, BioLogs). Next, some students seeded the disturbed soil with a mixture of riparian grasses while others followed behind with geotextile fabric. These students blanketed the streambank with straw-filled fabric to help hold the soil in place; they pounded staples, six inches in length, throughout the fabric to securely tack the erosion-control material to the slopes. Other students carried awkward coir logs, ten feet in length, to the newly-sculpted terraces and wielded sledgehammers to pound wooden stakes through the BioLogs? thereby anchoring them to the streambank. The coir logs, planted with water-loving sedges and rushes, will serve to catch sediments being transported via the stream; this dirt will ?drop out? from the water and collect within the log?s fiber-filled interior. After a year or so, the coir log will completely fill with dirt (and plant roots) and become part of the streambank. These newly placed logs will act to stabilize the toe of the slope and, consequently, help to prevent the entire streambank from erosion. Plants within the coir log will serve as additional anchors to secure these cylindrical structures to the streambank; they will also help filter sediments and nutrients from the creek and provide habitat for aquatic invertebrates (important food sources for fish and many species of birds). Cooperation between all of the partners (City of Troy, Troy High School, and PCEI) was instrumental to complete this first phase of this project in an effective and timely manner. We estimate that the total number of hours contributed to ate is 143. 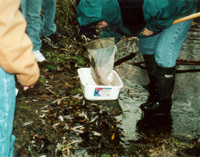 The second and final phase of the Troy project was conducted during the spring, 2000; students and PCEI planted vegetation along the newly-secured streambank. These plants helped to further stabilize the streambanks, filter runoff entering the stream, enhance aesthetics of the area, and provide habitat for wildlife. Prior to the restoration project, WSU?s Center for Environmental Education, conducted a stream-monitoring workshop with Troy High School sophomores in conjunction with PCEI?s environmental education staff, Ashley Martens and Lizabeth Edlund. Students examined the physical, biological, and chemical characteristics of Little Bear Creek to ascertain the water quality level. They analyzed the data and determined that the Creek was in need of restoration. Stream restoration site previously hosted a bridge crossing that had been removed. Bank erosion was a problem in the area. Troy High School Students work hard in cold weather: A student reshapes a streambank to construct a living terrace constructed of BioLogs (coconut fiber-filled logs). 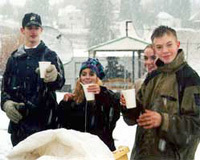 Warm relief: High school students enjoy hot chocolate with snowflakes during an afternoon of stream work. Students learned techniques in protecting stream banks from eroding: Students roll out geotextile fabric to prevent erosion along the resloped stream bank. Team building among classmates was another result of this project: Students carry a coir log (BioLog) planted with hydrophytes (wetland plants). The coir logs will help to stabilize the stream banks by stabilizing the toe of the stream bank. They are anchored into place using stakes approximately 2.5 ft long that are pounded through the coir log into the stream bank. Hard work in the season’s first snow: Students and PCEI staff (Anita Grover, purple) begin the second level of the coir log terrace. Geotextile fabric is placed along the entire extent of the disturbed stream bank and stapled into place. Students monitored stream health: In addition to completing the restoration project, Troy High School students also monitored the water for the presence of various stream insects and other macroinvertebrates.